Which tablet is best for your enterprise? CIO.com's mobile maestro Al Sacco explains seven key factors, from security to connectivity options, that enterprises must consider before choosing between the Apple iPad 2 and RIM's BlackBerry PlayBook. Steve Jobs tried to dismiss iPad's tablet rivals as "copycats" at Wednesday's iPad 2 launch. But whether Steve likes it or not, the tablet wars are officially on. And this battle will be decided not only by consumers and gadget lovers seeking the latest and greatest slates, but also by businesses and corporate workers looking for the next game-changing productivity tool. You can expect to see many Android-based tablets from the likes of Motorola and Samsung, just to name a couple of manufacturers. Two of the most anticipated tablets of 2011 are Apple's iPad 2; and BlackBerry-maker Research In Motion's (RIM) BlackBerry PlayBook tablet. While Apple is traditionally known as consumer-oriented company, RIM has in the past mostly catered to businesses, with a secondary consumer focus. And like these two technology giants, their respective tablets are worlds apart when it comes to enterprise features and functionality. Which tablet is best for your business? Here are seven key considerations that enterprise IT staffs and business users should take into account when comparing Apple's shiny iPad 2 to RIM's workhorse BlackBerry PlayBook. Perhaps the most important factor that any organization thinking about a tablet deployment must take into account is security. The PlayBook tablet was designed with security in mind, according to RIM, and though the company hasn't revealed exactly how future versions of the PlayBook will secure corporate data--more on this subject coming up--the initial, Wi-Fi only version won't store any corporate data on the device at all. Instead, the PlayBook will access corporate resources by tethering to a BlackBerry Enterprise Server (BES)-connected BlackBerry smartphone. In other words, the Wi-Fi only BlackBerry PlayBook will need to connect to a corporate BlackBerry smartphone for secure access to enterprise mail, calendar, tasks, etc. And while corporate data will be accessible via a smartphone-connected PlayBook, no enterprise data is ever stored on the tablet, making it an ideal option, at least from a security perspective--no sensitive data on-device means no data leaks if that device is lost, stolen or hacked. However, the need for a BlackBerry smartphone is a clear disadvantage for organizations that don't already use RIM handhelds, and this fact will no doubt lead some companies to opt for the iPad 2 or another tablet over RIM's offering. The iPad 2, on the other hand, connects to Microsoft's Exchange infrastructure for most of its corporate security features, as a BlackBerry smartphone would to BES. And a variety of third-party mobile device management (MDM) offerings from companies like BoxTone and Zenprise are available to add additional iPad/iOS-related security features. So, to sum that all up, the BlackBerry PlayBook should be a no-brainer for companies that are already on BlackBerry, and deploying the PlayBook shouldn't require any additional IT support, beyond basic instruction, since all PlayBook-related IT policies are pushed through BlackBerry smartphones. Organizations on Exchange but not on BES, or companies that have already invested in tools to help bolster iOS security, may be better off with iPad 2, since deploying BES and BlackBerry smartphones is currently required to access secure corporate data via PlayBook. Also, RIM has kept tight-lipped on the subject of how future PlayBook versions--the RIM tablets with cellular radios--will connect to BES, which means organizations may have to address additional security and deployment challenges with those devices. Many industry-watchers believe the process will be significantly different and won't require BlackBerry smartphones, though RIM hasn't offered any solid details. This could be frustrating for organizations that are anxious to deploy tablets, and it could push those organizations toward Apple and away from RIM and its PlayBook. 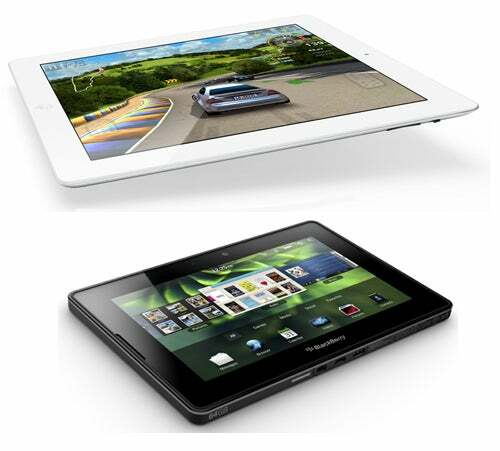 One obvious difference between RIM's PlayBook and the iPad 2 is size; RIM's PlayBook is significantly smaller, at 7.6 inches in height and 5.1 inches in width, compared to the iPad 2, which is 9.5 inches high and 7.3 inches wide. RIM's PlayBook is significantly smaller, though the iPad is thinner. As such, the BlackBerry PlayBook suits organizations that value portability over a larger display, and the iPad 2 appeals to companies looking for the most screen real estate available, regardless of portability constraints. RIM has stated that the Wi-Fi only version of its PlayBook tablet will become available in the first quarter of 2011, meaning before the end of March. However, recent rumors suggest the device will launch on April 10, and that sounds about right to me. The BlackBerry-maker also announced HSPA+ and 4G, WiMax and LTE versions of the PlayBook, though it didn't offer any launch-date specifics, saying only that the WiMax version should become available to Sprint customers sometime this summer. Apple didn't beat around the bush with its iPad 2 launch; the company announced a March 11 release date the same day it unveiled the next-generation iPad. And the tablet will be available with a variety of wireless connectivity options on March 11, including a Wi-Fi only version; an iPad 2 with both AT&T 3G support and Wi-Fi; and an iPad 2 with Verizon Wireless 3G and Wi-Fi. That means Apple's iPad 2 has an advantage over the BlackBerry PlayBook in that it should be available a full month before RIM's tablet. However, the iPad 2 only supports 3G CDMA and GSM wireless frequencies, i.e., no 4G for the iPad 2. The lack of 4G support in the iPad 2 seems to suggest Apple will announce either an upgraded version of the iPad 2, or possibly an iPad 3, in the not so distant future. So the iPad 2 could be a better option for organizations that don't want to wait until next month for a tablet deployment, even though the device only currently supports "last-generation" 3G cellular wireless. Companies for which cellular data-transfer speeds are a priority, or that don't want their tablets to feel outdated six months down the road, may want to skip the iPad 2 and opt for one of the 4G PlayBooks when they're released this summer. While no official pricing has been announced for any of the known versions of RIM's BlackBerry PlayBook, rumor suggests the entry-level, 16GB, Wi-Fi only PlayBook will sell for the same price as he 16GB, Wi-Fi only iPad 2: $499.99. The 32GB Wi-Fi only iPad 2 goes for $599 and the 64GB Wi-Fi iPad sells for $699. Apple also announced pricing for its 3G + Wi-Fi iPads: 16GB, $629; 32GB, $729; 64GB, $8.29. The PlayBook will also be available in 16GB, 32GB and 64GB versions, and RIM could potentially undercut Apple in pricing for its HSPA+ and 4G PlayBook. If it does, pricing could become a competitive advantage for the BlackBerry maker. In typical Apple fashion, the company left out a number of noteworthy facts from its online iPad 2 technical specifications lists, one of the most glaring of which is the lack of any information on the iPad 2's RAM. While I cannot say for sure exactly how much RAM will be found inside the iPad 2, one U.K. Apple representative recently said that the device would ship with a meager 256MB of RAM--less than the 512MB found in the current iPhone 4 smartphone. If that is the case, the iPad 2 and its owners are going to experience some performance "hiccups," to say the least, regardless of just how powerful its dual-core processor proves to be. It's more likely that the iPad 2 has at least 512MB, but Apple's silence on the subject is slightly worrisome. The BlackBerry PlayBook on the other hand packs a full GB of RAM. The iPad 2 could have as much as 1 GB of RAM, but I don't see the device shipping with more than that. So on the subject of RAM, the first-generation PlayBook packs the same amount or more than the iPad. From an enterprise perspective, the amount of RAM packed into a tablet could be significant, especially if organizations plan to run resource-intensive apps or services alongside each other. Both of RIM and Apple's tablets have front facing and rear cameras. However, Apple hasn't offered many details about the digital shooters it will ship with the iPad 2, saying only that the back camera is capable of capturing 720p, HD video up to 30 frames per second with audio. The iPad 2's lower-resolution front camera takes VGA video up to 30 frames per second with audio. But Apple didn't offer any solid details on still-camera megapixel counts, specifying only that the rear camera has 5X digital zoom and the front camera takes VGA quality images. RIM's BlackBerry PlayBook tablet packs a 3MP front-facing camera and a 5MP rear shooter, which can grab 1080P HD video. So for still-image and video capture, which could be valuable to remote staffers in warehouses and businesspeople in boardrooms, the PlayBook appears to have the iPad 2 beat, at least in resolution. Apple has a slight advantage over RIM when it comes to video conferencing, since it already has its own proprietary video-conferencing application and service, called FaceTime. But RIM must have some sort of video-conferencing offering up its sleeve, so we'll very likely see a related BlackBerry-announcement in the days or weeks following the PlayBook's release. The following speculation should be taken with a grain of salt, since it is just that: speculation. But the BlackBerry PlayBook tablet will very likely prove to be more durable than the iPad 2, due mainly to the smaller size of its display and rubber-like outer casing. And durability will surely be an important consideration for enterprises, especially those with remote workers in less-than-forgiving industries and environments. In general, the most vulnerable part of a tablet PC is its glass display. And the larger that glass display, the larger the likelihood that the display will be damaged. I have not yet handled the iPad 2, and as such I can't really gauge its durability. However, I have spent quite a bit of time with pre-release versions of the PlayBook tablet and it seems much more durable than the first generation iPad, which I've also had time to handle extensively. The fact that the iPad 2's display is very similar if not exactly the same as the first iPad's screen makes me think the two models will be similarly durable. Of course, RIM, Apple and countless third-party case manufactures will offer products to help protect your tablet, but those products will often add bulk, and organizations that want the smallest, lightest tablet possible, won't want to sacrifice portability for protection. So the BlackBerry PlayBook may be better suited for companies with mobile workers in rough or demanding environments.